Life in the classroom is never the same for all children and teenagers. Some students do very well, while others need a little more help, time, or other accommodations. When it comes to observing a student’s reading and learning abilities, educators often have a birds-eye-view on a student’s academic success. And when a student succeeds, an educator or parent may feel great joy. However, more often than not, it’s the struggling child that “keeps us up at night,” especially when we’ve done everything we can to help these students. And while you’re reading this, I’m sure there is at least one child that comes to mind. Well, what if I told you a vision problem may be the reason why a student struggles in school. Now, I’m not talking about their ability to see 20/20 with glasses or contacts. I’m talking about much more than that. Allow me to explain. Since many of these behaviors are commonly linked with ADD or ADHD, many might think a student has a behavioral condition or dyslexia. 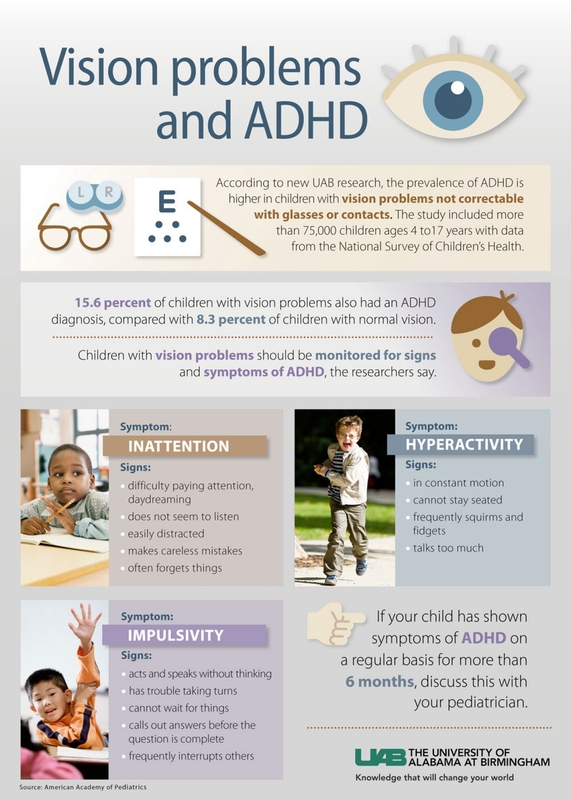 But did you know that ADHD and vision problems share many of the same symptoms? When a child struggles in school or shows signs of ADHD, we may turn to a school psychologist, special education teacher, or a pediatrician. 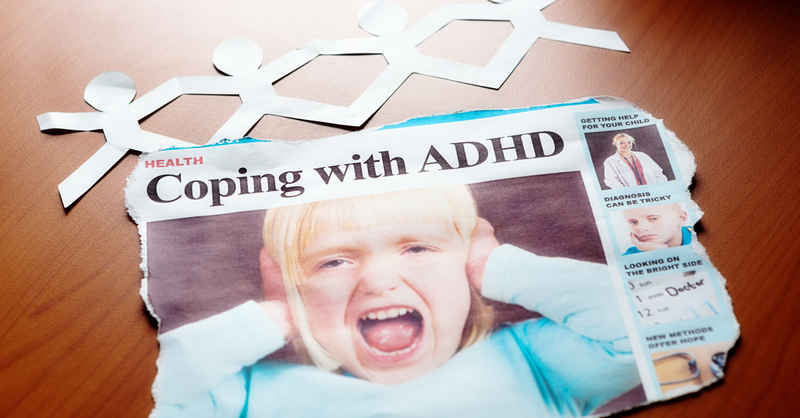 However, when it comes to the visual connection to ADHD, the research is becoming more clear and compelling. Students with vision problems that are not correctable with glasses and contacts, typically show signs of ADHD. These symptoms include inattention, hyperactivity, and impulsivity. To elaborate, check out this infographic from the American Academy of Pediatrics produced by the University of Alabama at Birmingham! Their study sheds light on a link between vision problems and ADHD in children. 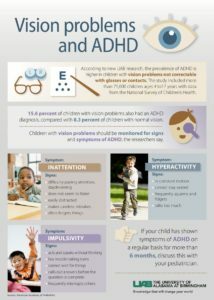 So when a child displays symptoms of ADHD, it’s important to first rule out visual efficiency and/or visual information processing problems with a comprehensive eye health and vision evaluation. To better explain the visual problems affecting students academic success, Dr. Richard Maharaj, O.D. put together an amazing video to help teachers and parents understand the relationship between vision and learning. Check out their video below. So once we recognize that a vision problem may be causing a reading and learning problem that is affecting a student, what can we do? The first thing a teacher can do, to help these students, is to suggest a comprehensive vision evaluation with a developmental optometrist or a primary care optometrist. The parent or guardian should then share the academic concerns with their optometrist. After the initial evaluation, your optometrist may recommend vision therapy. This rehabilitative program is prescribed to treat developmental and/or neurologically induced dysfunctions of the visual system. Following vision therapy, students typically obtain significantly improved visual abilities which leads to improved academic performance, and coordination skills. These improvements often lead to a greater sense of confidence, empowerment and overall quality of life. If you would like to read more about vision therapy, please visit our main website at wowvision.net or visit covd.org. Concerned your child may be struggling with a vision and learning problem? Schedule an appointment today with one of our teams.